The holidays are all about giving. That’s why, this season, I am making a difference for animals. 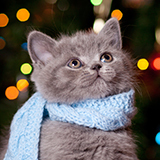 Join me in raising funds to brighten up the holidays for homeless pets and animals in need. Your donation will help the ASPCA provide life-saving programs and services to millions of animals nationwide. The ASPCA is very important to me and I appreciate your help as we fight to give abused and homeless animals a second chance at life. In lieu of holiday gifts, please support me by making a donation and help me make a positive impact in the lives of animals! Thank you! Is the Holiday Spirit calling you to take action for homeless pets and animals in need? You can create your own Holiday Campaign here.